The Newcastle branch of Accuweigh has recently supplied EMA Consulting Engineers with customised platform scales for weighing CB7 containers. The platform scales were fitted with conveyor rollers to enable the CB7’s to be rolled on and off the platform scales with minimum effort. A platform scale frame, without load cells, was fitted with conveyor rollers on the top plate and large castors were placed underneath. This allowed it to function as a mobile trolley for moving the CB7’s to and from the platform scales. 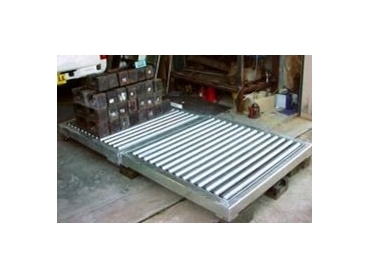 A500 platform scales from Accuweigh are Australian manufactured and use quality BPH steel and hot dip galvanised to avoid corrosion in wet areas or when pit mounted. The platform scales have a clean under-plate design to eliminate product spillage from building up around the load cell mountings, which is a main cause of load cell failures in pallet scales that are used in food areas. The heavy steel checker plate is welded to the rigid frame and has multiple cross braces to eliminate deflection under heavy loads. The platform load cells are rated to 150% overload and fitted with self-aligning levelling legs that are height adjustable for use on uneven surfaces.